Solace Beach Estates is proud to offer live music, dance, and theatre events weekly at our venues. Here are some of the talented artists who perform regularly. Funkyfreddy is a gifted songwriter and multi-instrumentalist with a melodic style that mixes folk, rock, and Americana with a hint of ambient pop. His slide guitar and unique ambient guitar styling have dazzled audiences throughout New England. His voice and songwriting are reminiscent of artists such as Neil Young, Elliott Smith, Syd Barrett and Pink Floyd. Fred is also well known as the guitarist for Neighbors + Allies, one of David Bowie’s favorite NY bands. 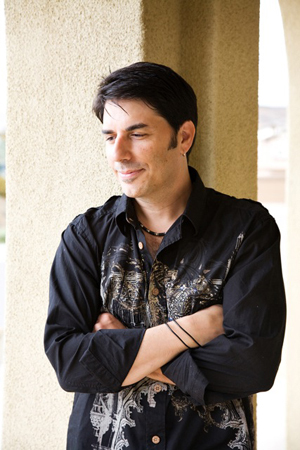 Fred has composed and performed music for Wall Street Journal TV, PBS, Time Warner, Sesame Street, and Strange Universe. Fred has recorded two albums, Ghosts of Another America, and the newly released Songs from the North Country. A fine sense of ambience, space, and musicianship underlie insightful lyrics. Both albums are available on iTunes, Amazon, and CDBaby. In addition to his solo work, Fred performs with Broadway performer and singer-songwriter Tamra Hayden, as the band August Moons. They bring their diverse musical backgrounds together to create a unique sound featuring guitar, viola, and vocals. Their collaborations can be heard on Fred’s latest album, Songs from the North Country, and additional recordings are planned for 2012. From Broadway to the Blues, critics have called Professional Actress-Singer/Songwriter, Tamra Hayden, an ’emotionally rich, psychologically detailed singer that can reheat coffee’ and ‘outsizzle Peggy Lee’. Tamra Hayden performed on Broadway as Cosette in Les Miserables and Texas in Cabaret (Studio 54); Off-Broadway in Jacques Brel Is Alive And Well And Living In Paris; and has toured throughout the US as Christine in Phantom of the Opera, Cosette in Les Mis, It Ain’t Nothin’ But The Blues, and Hodel in Fiddler On The Roof (opposite Theodore Bikel). A versatile singer, Tamra has performed Broadway Pops with Palm Beach Pops, The Nashville, Charlotte, Tucson and New Jersey Symphonies to name a few. Chosen as one of the “Top Ten to watch in 2010” by CDBaby, Tamra’s numerous musical collaborations have resulted in a wide variety of recordings: Reggae On Broadway; Traditions, Tartans and Tears; Stars At Night; Songs From The North Country; A Day At The Fair; I Believe In The Fire; Angus Mohr’s: A Christmas Pageant; and Unwrapped. As a musical activist, Tamra’s music has raised awareness for Union Collective Bargaining, Relay For Life, and Veterans for Peace. The video of her song, Eden Will Bloom, was presented at The Puffin Cultural Forum Poetry Jam For Peace. Tamra graduated with honors earning a Bachelor of Music Degree in Vocal Performance from the University of Northern Colorado. She was awarded a MacArthur Scholarship as well as a scholarship for Viola. Currently, Tamra sings in an ongoing Cabaret, Jacques Brel Returns, in New York. Plus, she sings lead and plays Viola in August Moons (a New York based band) and Traditions, Tartans and Tears (a Colorado based Celtic Group). With over 20 years professional Real Life touring experience, you won’t want to miss Seth Regan! Known around the metaverse since November 2006, Seth performs his very popular original rock music and the best rock/pop hits from the ’60s through today. His shows are always full of energy and very often, driven by audience requests from his vast repertoire. The vibe at his shows is always uplifting and tons of fun!